Presenting the only weekly Tokyo open mic comedy show! It’s just a short walk away from Otsuka station on the Yamanote Line. Titans Craft Beer is the home to our latest and greatest open mic, so come down for some laughs, beer and gyoza! 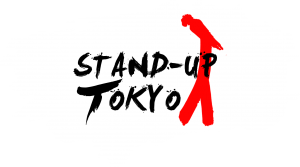 What is Tokyo open mic comedy? This is a true Tokyo open mic comedy show – please indicate that you are via the Facebook event page. However, we will try to accept all comers with sign-ups closing at 19:45 at the venue. Everyone gets at least four minutes to perform, and in some cases more. Often, performers will get a second attempt if there is room on the bill. It’s really relaxed and easy-going – perfect if you’re trying comedy for the first time. No need to bring an audience, as the room is small and we have a bunch of kind, giggly comics. Saying that, we also draw an independent audience of our own. Also, please feel free to bring a group of friends who enjoy Tokyo open mic comedy. We welcome anyone who wants to try comedy, whether it be regular stand up, characters, improv, crowd work, sketches, music or something completely new. Sometimes we even have Japanese language comedy and live podcast recordings so, you never know what you might get! Our excellent venue, the centrally-located Titans Craft Beer Taproom, has a full and varied menu of craft beers. These change regularly as well as three different types of delicious gyoza, so you can drink and eat while you laugh. There will also be special beers sold at a discounted rate of ¥500!! What!?! Get on the Mic! is a space for trying new things, workshopping ideas and making your comedy debut in Tokyo! So come along at 7.45pm and have fun with us, whoever you are and whatever kind of comedy you like.